If you were looking for grand 19th Century churches, you probably wouldn't bother coming to Suffolk. Outside of the four big towns, there are hardly any. 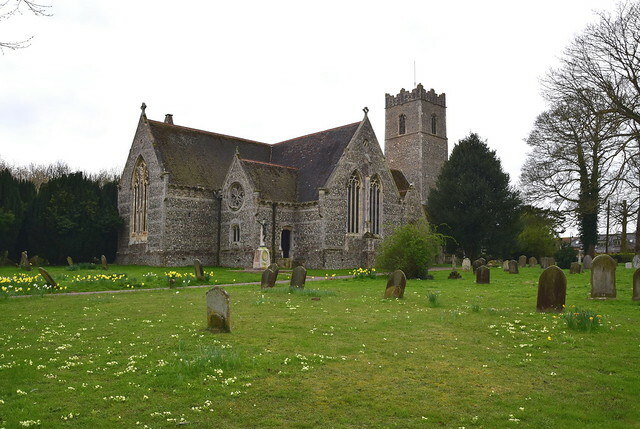 The major exception to this rule is what is probably Suffolk's most significant 19th Century church of all, Edward Buckton Lamb's St Margaret, Leiston, and there are unusual reasons for it being what it is and where it is - unusual in Suffolk, anyway. 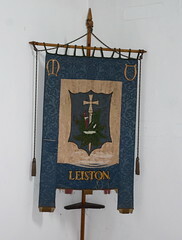 In the 1780s, the population of Leiston was about 400, making it a fairly typical middle-sized East Anglian village community of the time. But then, Richard Garrett expanded his Woodbridge blacksmith's shop by opening an engineering works in Leiston, and people flooded into Leiston from all over the region. The Garretts and the Ropes are two families whose names cast a long shadow over this town, and are vividly remembered here in this church, as we will see. 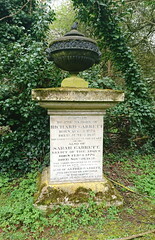 The Garretts made agricultural machinery, rivals to their equally dynamic neighbours the Ransomes of Ipswich. Many of the ploughs and harrows that tamed the British Empire were forged in Leiston and Ipswich. 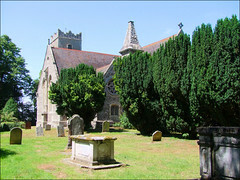 By the 1850s, the population of the village had reached 2,000. And by the early 20th century, it was over 4,000, a more than ten-fold increase in a little over a hundred years, unprecedented in a county where, by and large, the Industrial Revolution was something that happened to other people. It became clear in that extraordinary age of faith, the 1850s, that the medieval predecessor to St Margaret was simply not big enough any more. We know that it was a long, thin church. A contemporary report describes it as 'like to being in a tunnel', not uncommon in east Suffolk, although St Margaret was longer than most at 128 feet. Lamb's brief was to build a large, squarish, cruciform church, on the site of its predecessor, retaining the noble 14th century tower. The church was to be fitting for protestant, evangelical worship, because the Vicar of St Margaret was a firebrand preacher, the Reverend J.C. Blathwayt, very much against the new sacramentalist grain. But he had to compete with the non-conformist churches which had wasted no time in arriving to serve the spiritual needs of Leiston's poor migrant workers. The rest of the Church of England at this time was busy rediscovering its Catholic roots, and had turned to the Camden Society and the Oxford Movement for approved architects, who were designing in the proper English medieval manner. Lamb was by no means one of these, which is perhaps why he was chosen here. He was a maverick, a man ploughing a lonely furrow, mixing and matching and generally reinventing in the High Gothic manner. His only other work in Suffolk is at Braiseworth, now redundant. His design for St Margaret was revolutionary - or, at least, his execution of it, for he changed the plans as he went along, and totally ignored the tight budget he had been saddled with. 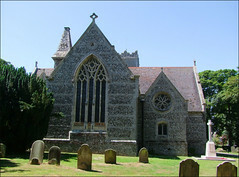 The new church was aligned in the same direction as the old one, and was of roughly the same length, but in a most unusual shape with a wide nave and central crossing and short transepts each wider than the nave itself. If you had come here in the last decade of the 20th Century as, for the first time, I did, you would have found the building filled with rather sombre mid-Victorian pews, the weakest feature of the whole church, and no wonder, for Lamb had them made of the cheapest stained deal, so that he could use the furnishings money elswhere in the church. But these have now gone, and Lamb's gloom has been dispersed to an extent by the major reordering of the first decade of the 21st Century. 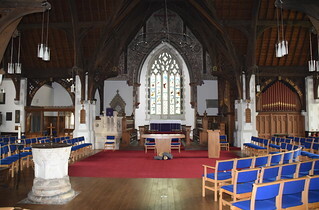 The floor has been carpeted, the pews replaced with modern chairs. 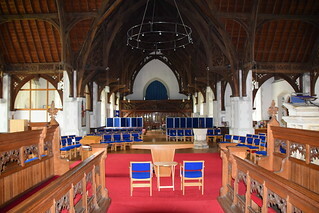 The nave and transept seating faces towards the central altar. 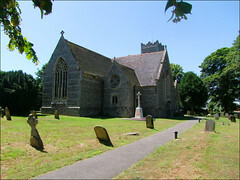 The new church was opened on August 31st 1854 by Bishop Blomfield of London, who had been born in Suffolk, and was, coincidentally, the father of that most prominent in Suffolk of all major 19th Century architects, Sir Arthur Blomfield. 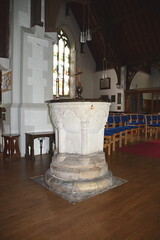 But the finest and most remarkable features of the church are after Blathwayt's time. In 1874, he was succeeded by Father Berney Wodehouse Raven, who cleverly and gently introduced high Anglo-catholic practice here. During the course of his ministry, and that of his successor Father Roe, and then in the years afterwards, the aspects of this church that make it so singular found their home here. Lamb had foreshortened the chancel dramatically, the great east window drawn forward to impose itself. In the 1890s this was filled with glass remembering Mary Ann Garrett of the Garrett foundry family, the saints depicted being popular in the late 19th Century High Church tradition. Mary Ann is depicted in her old age as as St Felicity, the final figure, the whole piece the work of Kempe & Co, not a workshop I'm a great fan of, but this is really very good. Six candles sat on the retable behind the high altar, which must have had the Reverend Blathwayt spinning nicely in his grave, for this parish embraced wholeheartedly the Anglo-catholic movement in the early years of the 20th Century. 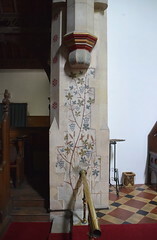 The walls were decorated, vine stencilling climbs the inside of the chancel arch, the space above the crossing disappearing into a mystical gloom. This was enhanced by Lamb's most remarkable feature, a roof that looks like a mathematical puzzle, and was either inspired by, or a joke at the expense of, the famous medieval roofs of Suffolk. The most striking aspects of this church's 20th Century elaboration are almost entirely the work of one family, the Ropes, whose windows and reliefs are found in several churches in Suffolk, as well as churches and cathedrals all over the world. They lived in this parish, and in the north transept, we find the finest hour of Margaret Edith Aldrich Rope ('Tor' to her family - you can see her tortoise symbol on the right hand side). Installed in 1959, the windows remember Tor's parents and a local doctor. The left hand window shows scenes from the Gospel of St Luke. 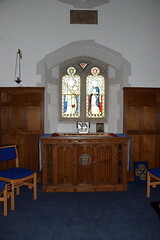 The right hand window, with the theme of St Matthew, is a memorial to her parents, who died in the 1940s. Remarkably, the work that is here today was only half of that which was planned, for the two windows in the opposite window are full of clear glass, but would have been intended for windows themed for St Mark and St John. The two windows are so rich and complex that I have placed photographs of them on two separate pages. 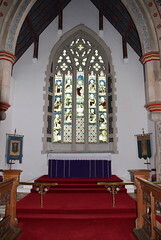 Click on the window on the left to view details of the St Luke window, and click on the window on the right to view details of the St Matthew window. 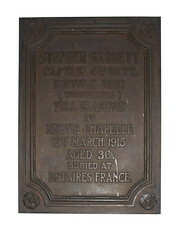 The transept contains a bronze art nouveau memorial to the young Arthur Rope, designed by Dorothy Rope, his sister. 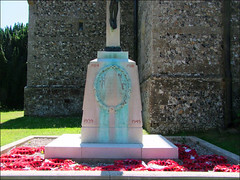 She was also responsible for the war memorial outside. 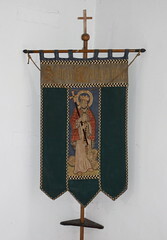 Another Rope cousin, Ellen Rope, designed the lovely, sentimental relief of the Adoration of the Shepherds, but this has now been hidden away in the vestry which replaced the children's corner in the 2006 reordering. 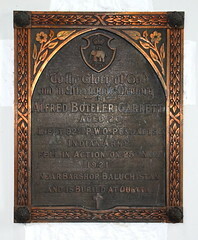 The transept also contains memorials to the Garretts, including the mural monument to Richard Garrett, who is buried outside the south door beneath one of the cast iron memorials his foundry produced. 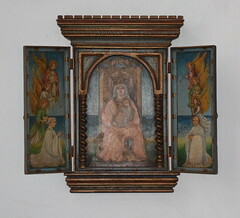 The triptych of the Blessed Virgin and child with Leiston Abbey in the background was by the Marquis d'Oisy, whose work can be found elsewhere in East Anglia at Thaxted in Essex. On the south side, the transept contains the long rood beam installed ill-advisedly in the late 19th Century, the removal of which can only have been a relief. 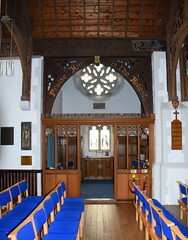 On the north side of the chancel is a sweet little blessed sacrament chapel, its 1930s woodwork the work of Henry Munro Cautley, diocesan architect at the time and designer of several such pieces in Suffolk of a feature he was wholly in sympathy with. 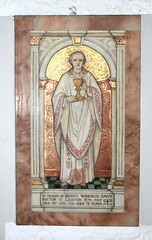 An intriguing detail is the stained glass in the small window above his altar. 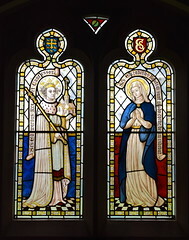 It depicts St Edward the Confessor and St Anne. It was installed here in the 1930s, and at first sight looks as if it could be the work of someone like FC Eden, and then you notice the carefully drawn sad faces, the chequerboard floors, the low-walled backgrounds, so typical of East Anglian figures of the late 15th Century. They are, in short, remarkably articulate figures, and I couldn't help wondering if they might have been designed by Cautley himself. The only recorded glass by Cautley was at the original 1920s church of All Hallows in Ipswich, now the church hall to its much larger 1930s replacement. The subjects of the glass there were not noted, and it has since disappeared. Is it beyond possibility that this is the glass from the original All Hallows, reframed and reset here by Cautley when he was building the new church there, and this little chapel here? It would not be true to say that the early 20th Century embellishment, and the early 21st Century reordering, have entirely dispelled Lamb's gloom, for that would be difficult in such a vast space. But the church appears lighter and warmer than when I first visited it twenty years ago, and I couldn't help wondering how wonderful it would be if the south transept windows could be completed to match those in the north transept, perhaps by another high quality East Anglian woman artist? Pippa Blackhall springs to mind, if the PCC has any money. Perhaps it is appropriate that Lamb, a maverick architect, designed this maverick church here, because Leiston is a most curious place. You arrive from what is probably the wildest part of Suffolk, whichever way you enter it, to find yourself briefly surrounded by red brick terraces, council estates and corner shops. And then, you are out in the countryside again. The main shopping street is, obviously, all 19th and 20th century, and has the feel of a miners' town in the north about it. The trouble with towns that only have one employer, of course, is what happens when that single employer closes, which is exactly what happened to Garretts in the 1970s. Then, Leiston really did become like a miners town. The great salvation to the locals was the Sizewell nuclear power station, which stands a mile or so to the east of Leiston, and employs just about everybody in it. A great curiosity is the way that Leiston lives in symbiosis with Aldeburgh, a town of almost exactly the same population just three miles away. Aldeburgh, as you may know, is one of Suffolk's poshest, classiest towns. Leiston, and let us be frank here, is not. It is as if a normal town had been split in two, one part keeping the big houses, wine bars and designer clothes shops, the other keeping the blue collar estates, working men's clubs and industry. And yet it is Leiston which has one of Suffolk's most remarkable testimonies to High Victorian Gothic, and to the Arts and Crafts movement.